﻿ Lanai Health Guide - Green Business Directory - Seeking Sustainable, Eco-Friendly Hawaii Businesses! Lanai Health Talk Green Business Directory - Seeking Sustainable, Eco-Friendly Hawaii Businesses & those wanting to "Go Green"! 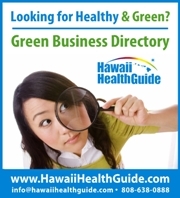 Green Business Directory - Seeking Sustainable, Eco-Friendly Hawaii Businesses & those wanting to "Go Green"! If you're doing something health-related or green, you belong on Hawaii Health Guide! Are you a green business? Want to become one? We'd love to support & promote you. Hawaii Health Guide’s new Green Business Directory is poised to support and promote sustainable, eco-friendly business practices. Not “just another Green Guide…” the directory is locally owned and operated, human-edited, and green businesses are personally screened and certified by local sustainability organizations to verify and improve their eco-friendly practices. The Green Business Directory is partnering with sustainability organizations (Sustainability Association of Hawaii & Malama Kauai), to produce a substantial, meaningful resource for the 5,000-7,000 unique visitors per day who peruse about 30,000,000 page hits per year on HawaiiHealthGuide.com. Your own unique webpage on www.hawaiihealthguide.com, with over 30 million hits per year! Your own page on the Directory includes 3 images, full contact info, maplink, link to your website, and unlimited text. Inclusion in as many categories as apply to your business (out of over 900), such as Health Food & Restaurants, Accommodations, Health Practitioners, etc. Discounted rates on booths at the Healthy Hawaii Expo and Hawaii Healing Garden festivals. A free introductory coupon in the HonuGuide, a coupon book for sustainable island living ($150 value), and discounted ad rates. The most effective, affordable advertising for your budget. Read more about the benefits of Hawaii Health Guide here. Placement on the annual Mālama Kauaʻi Green Map, a free map distributed throughout Kauai. Umbrella promotion through Mālama Kauaʻi’s radio show, television series, magazine and newspaper articles. Discounted advertising package offered through the Hawai`i Health Guide Statewide Green Business Directory, with over 30 million hits per year! Sticker and certificate of participation to display at your storefront. Green Business Packages start at only $899/year for featured advertising, or $500/year for a basic listing. We pay your certification fees of $100-$150/year. This offer is available ONLY to businesses going green - our way of supporting the transition to a greener Hawaii. A list of green business qualifiers/certifications accompanies each entry in the directory, providing transparency to the site visitor regarding the depth of each business’s commitment to sustainable practices. In other words, it's not a "greenwashing" marketing trick, but a real directory to real green businesses. Hawaii Health Guide is deeply committed to sustainability on the islands, and we want to help businesses make meaningful improvements to their environmental impact, marketing efforts, and bottom line.